The Software Heritage mission is to collect, preserve, and share the source code from all publicly available software. 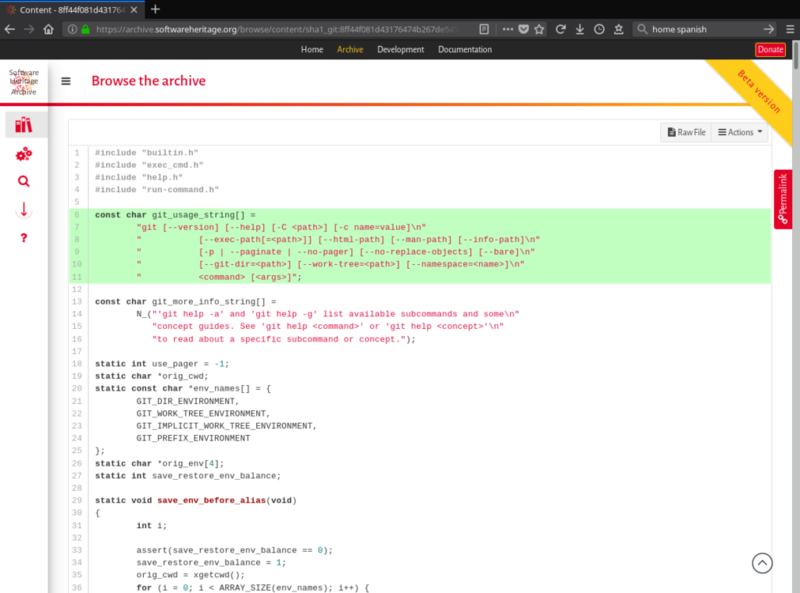 An important milestone for the project was enabling access and browsing of the Software Heritage archive, and a year ago we made a first step forward by enabling programmatic access via a RESTful API. On June 7th 2018, at the Unesco headquarters, we were delighted to unveil to the public a web application that provides easy access to the content of the Software Heritage archive, opening the doors of this Library of Alexandria of software source code. We have been including features aimed at making the archive more accessible to a wider audience, and this blog post will guide you through them. Clear presentation of the full development history of an origin trough the chronological display of a list of commits (called revisions). The display of the history for a particular content. A permalinks tab that allows users to easily get the Software Heritage persistent identifiers needed to reference or cite a software source file, revision, release or snapshot. Since the beginning of development in September 2017, we have experimenting internally a range of features to the browsing interface. Main efforts since then have been made to implement the core browsing features common to web interfaces, available for navigating within source code trees in the Software Heritage archive. To browse the archive, two different kinds of views are offered: context-independent and context-dependent. To get more details, please refer to the complete URI scheme for SWH Web Browse application. contents (source files): All source files collected by Software Heritage can be browsed by their checksum values computed using different hashing algorithms (SHA1, SHA256, etc). The corresponding HTML view offers syntax highlighting, display of line numbers and the ability to emphasize a specific block of code. directories: All directories (referencing contents and other directories) collected by Software Heritage can be browsed using their computed identifier. revisions (commits): All revisions collected by Software Heritage can be browsed using their computed identifier. 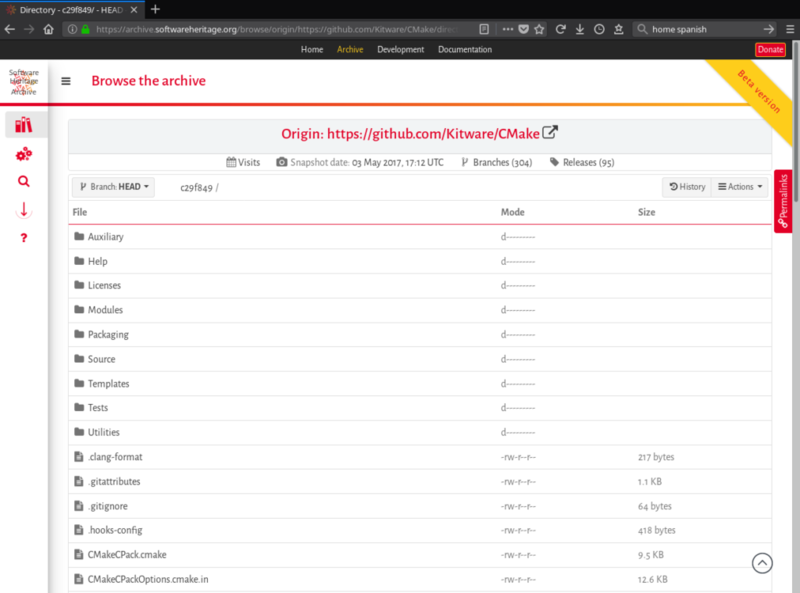 The corresponding HTML view allows to browse the source tree associated to the revision but also to see the list of file changes and their diffs. 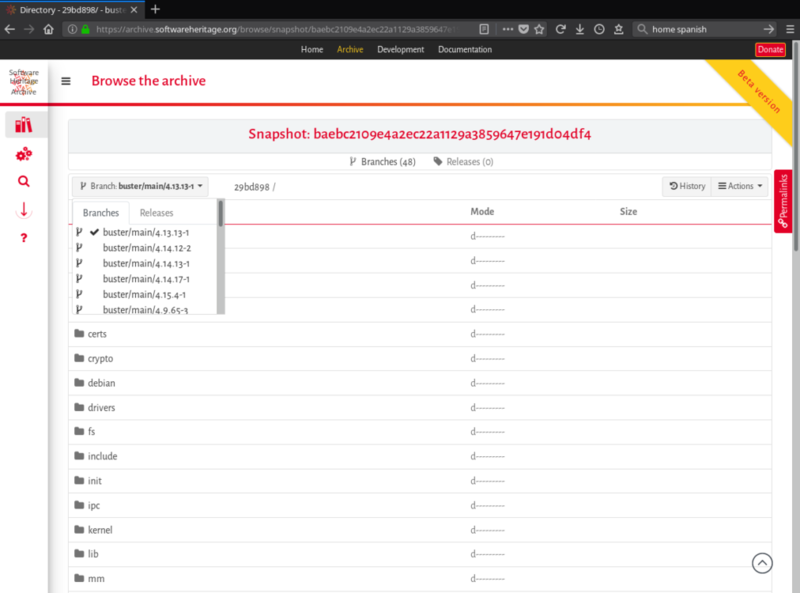 snapshots (set of branches and releases found during the visit of an origin): All snapshots collected by Software Heritage can be browsed using their computed identifier. The corresponding HTML view enables to easily switch between all the branches and releases contained in a snapshot. Context-dependent browsing provides information about objects collected by Software Heritage, limited to the specific contexts where the objects have been found. Currently, one can browse Software Heritage objects in the context of an origin. All browsing features introduced above are available in that context, but the displayed software artifacts are those collected from a given software origin during a specific visit from a Software Heritage crawler. In order to facilitate such a browsing and generate relevant entry points to the archive, an interface is available in order to search for origins visited by the Software Heritage crawlers. Currently, origins can only be searched based on the url they were retrieved from, but more search criteria will be progressively added over time. As Software Heritage is developed transparently and collaboratively, all software components are released as Free/Open Source Software (FOSS). 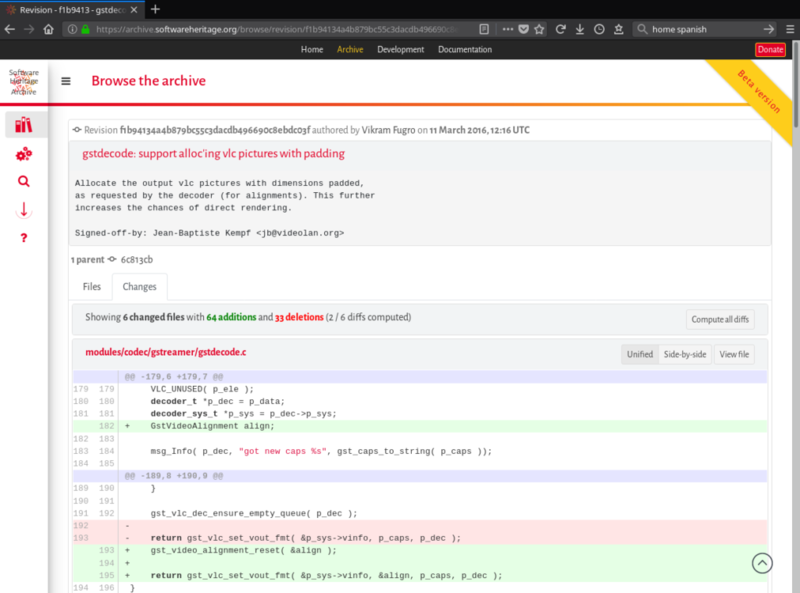 Thus, all the source code for the Software Heritage web applications is publicly available in the dedicated swh-web repository hosted on our development forge. Software Heritage components mainly developed using Python 3. We use the Django web framework for powering the web application on the backend. For the frontend, we use webpack to bundle the different assets (scripts, stylesheets, etc) served to clients. We rely on well-known web frameworks to implement the graphical interface like Bootstrap or JQuery. For those interested, you can refer to the modules description of swh-web to get a better understanding of the source code organization. Implementation of an interface to add new origins to the archive for instance by specifying the url of a source code repository to visit. Contributions to the development of the Software Heritage web applications are also welcome. Please refer to our Development information page and our public wiki for more details.